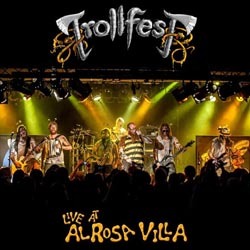 The pioneers of true Norwegian Balkan metal, Trollfest from Oslo will soon release their first live recording ever, entitled “Live at Alrosa Villa“! The album was taped during their fantastically frantic Brumlebassen US tour in 2013 at the Alrosa Villa, Columbus Ohio on April 14th 2014 and it will feature 9 songs. TrollfesT have already revealed the album tracklist and the cover photo taken by Chris A Photography. “Live at Alrosa Villa” is mixed and mastered by Martin Skar Berger Productions and will be available digitally only, on most platforms like Spotify, iTunes, etc… The official release date is set for May 4th 2015!